I find this to be ironic. You see, it's common knowledge that zombies die when you decapitate them. 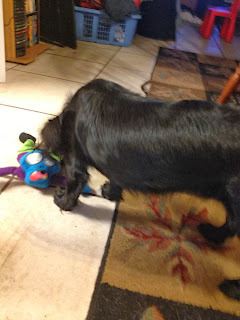 But it is damn-near impossible to decapitate a Go Dog Zombiez toy! Go Dog, by Quaker Pet Group, is a line of durable doggy toys. Some crinkle, some squeak, some do both. They come in various sizes, and they are pretty tough toys. And in a moment, I'll tell you how to win one! Lulu's been trying to rip the squeaker out of this Go Dog platypus for a couple months now, with no luck. But these Zombiez don't look like anything from "The Walking Dead." They are actually kinda cute, in an undead way. Quaker says it uses what it calls "Chew Guard Technology." The toys have a liner in the plush toys that guard against ripping the toys up. They are also all made with double stitched seams, so they don't open easily. I won't say the toys are indestructible. A friend of mine at Pet Age magazine said her dog was able to destroy a Go Dog. 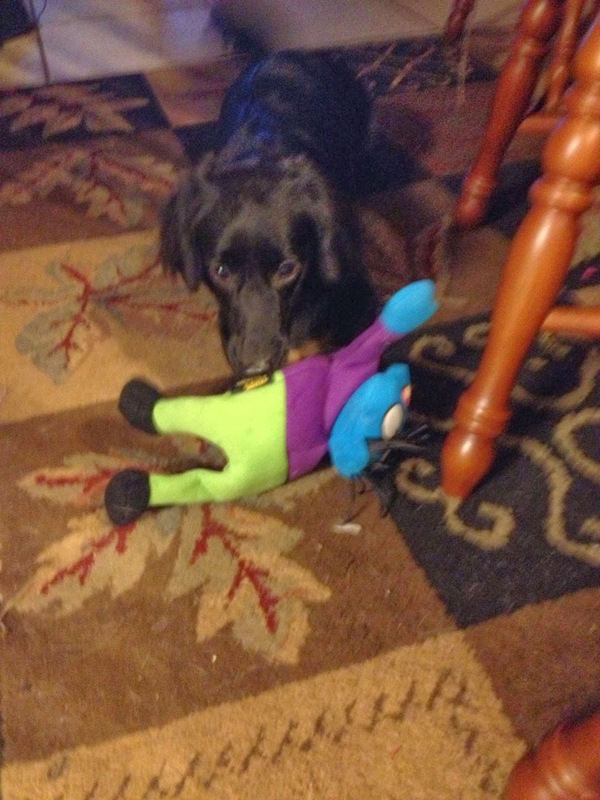 But also to Buster, my parents' black lab/dachshund mix. This dog destroys EVERYTHING. And his sibling Jasmine, a beagle mix helps. So far so good for ol' Frostbite Fred. There are seven different Zombiez -- four plush and three flat crinkly ones (they're called crawlers). They come in two sizes -- small and large. While the small have squeakers, the large ones have what they call "grunters." The squeakers also "float" through the toy, so it takes dogs longer to rip them out. Which they shouldn't be able to do with a Go Dog anyway. The Zombiez toys are kind of awkward for the dogs to grab. I noticed while playing that the dogs avoided the head of the toy because it was so big. They size of the head versus the "neck" may make it easy for dogs to rip it off, but again I have not had that problem. NOW -- TIME FOR THE GIVEAWAY! 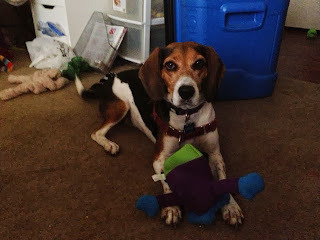 Quaker is giving away three Zombiez toys -- so three chances to win! We will be using Rafflecopter to count the entries and choose the winner. The contest ends on Halloween! Mandatory entry: In the comments section, Tell us how you include your dog in Halloween festivities! It could be a costume, or a spooky bandana, or just joining in on Trick-or-Treating or other activities. Or maybe your dog doesn't do Halloween -- tell us that too. That looks like a great toy for Torrey. Lub Zombies. Wish dey made kitteh toys too! Mr. N wears a costume. Unfortunately, we don't get trick-or-treaters so he can't help out there. Oh what fun! This is a great giveaway! We're not toy people, though. The dogs, I mean. They play with the chickens. Great giveaway! My dog has ripped apart EVERY dog toy I've given her! Would love to see if a zombie holds up to her! ;) I love to include Maggie in trick or treating!..she loves getting dressed up! The other day, my boyfriend asked if the pet store had any alien toys, because he wants to train the dogs to attack aliens in case of invasion. I think zombie toys are a good idea too. We love dressing our dogs up, but Mia especially dislikes it, so we go easy on her. We're celebrating by getting them new Halloween toys, and yesterday, I took pics of them in their Yoda ears from BlogPaws. Cute toy! Rita doesn't do Halloween. Hates getting dressed up. Hates people ringing our bell! Hates all the scary decorations in the neighborhood! It's probably her least favorite holiday. Fourth of July got nuthin' on Halloween! I hand make costumes and we enter pet contest!! I dress my pets up and take pics. They love it! We try to put a costume hat on but we know it won't last 5 seconds. Sammy and Shiloh will be helping me hand out candy to kids in my church at trunk or treat. Then hopefully after Halloween they can chew up a Zombiez toy all they want! We participated in a Monster Mutt Dash to support local animal rescue. .. and will help hand out treats... if they don't eat the first!!! We dress our dog up, but he stays home on Halloween. Zombies and scary costumes put him on high alert and he goes in to "must protect my people" mode! Our doggies usually don't do Halloween! Teddy is spooked by the little kids and won't wear a costume for anything. I've been trying to decide if I should try to dress Scout and Ash up! We'll see! I do some dog events that have costume contests, but rarely enter the contests because my dogs aren't in to being dressed up. Love these toys! Hope we win - my pack needs some new ones! Our dogs dress up every year and go with me and the kids for trick or treating and they always get some treats of their own for their bags! My dog gets a halloween collar, we don't really do much for halloween, I love to decorate but mostly we just watch some horror movies and relax. We don't get many trick or treaters, but mom and I LOVE to go watch the zombie walk. A lot of dogs get freaked out by the zombies, but not me! This is the first year that we think Huffle will be able to do Halloween. Trick or treaters scared him in the previous years, but I think he's getting better about it! Nothing says Halloween like dressing up and handing out candy, my lil Shiloh is good at it and he loves the kids and they love him!!!! This year is suppose to be cold so lil shy night have to wear a sweater stead of a costume so he stays warm! We work nights, so we're not home during the trick-or-treating, but we do give our dogs Halloween-themed toys and sometimes even dress them up. Doak--my beagle/coonhound wears a Halloween Bandana and we did the trunk or treat this past weekend-- but since Halloween is during the week, we can't do too much this year. Doak would love to win one of these zombie toys--too cool! I let my dogs bark everytime the door bell rings. Ooooooh! Getting it in under the buzzer!